For years, more and more athletes have been participating in all kinds of yoga practice to strengthen and improve their balance, physical mental performance in elite sports. Even for casual golfers, yoga can have an immediate and dramatic impact on one's game: helping prevent injuries & strain, reducing strokes and improving overall control of ball flight. CPGA Professional, Chima McLean who has now been practicing yoga for more than a decade, says “Yoga is a great help to golf… It previously helped my back problems immensely to the point where I can walk carrying my golf bag again… I now recommend all my clients try yoga – even if they don’t immediately realize the benefits of increased mental focus, added strength and personal control over stress, everyone can enjoy golf more with the added flexibility from yoga.”Mike, a yoga for golf student at The Adelaide Club in Toronto shared his success story: “I’m currently playing to a 12 handicap, drive the ball 265-270 on average. After just one class, I found two major improvements in two consecutive rounds. Specifically my short to mid iron game, without even knowing it, I was able to get my club to the top of my backswing with ease and in combination with breathing exercises (again subconsciously) recoil my body with an effortless tempo… key result was my ability to control ball flight, high or low, whatever the situation required. Both rounds I scored 5 strokes lower than average, but maybe the best part of all is an increased confidence level over the golf shot. For the record, I’m not a gadget, watch videos how to improve your game type guy, I just like to go out and play. What intrigued me about this was that I’ve always had an interest in yoga (primarily for the long tem benefits), but never the courage not the time, as a lover of the game, simply attaching the word “golf” to it and concentration of the “core” (which is the golf swing), was enough for me to try it. 'I'm impressed ... 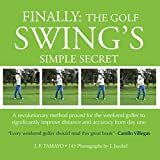 I can't wait to put the theory to the test.... A very readable exercise for the golfer who wants to understand the basics of the swing and how to put them to work.... I totally recommend this book to all golfers. 'Golf Today, November 2012'Simply, this is the best golf book written in recent years. Highly recommended. 'Dan Parks, Editor-in-Chief, Journal of Applied Golf Research, December 2012 The Golf Swing answers that eternal question: why is the golf swing so frustratingly difficult? And the answer is - because we make it difficult. This book explains the problem - the 'swing theory quagmire' that confuses and perplexes us. It goes on to outline the solution: a simple, effective, and enjoyable way to improve.Using a scientific review of more than 200 research articles, author Chris Riddoch explains how dissecting the swing into a complicated sequence of angles and positions actually prevents improvement by stifling our powerful, innate skill-learning mechanisms. The way to a better golf swing is to liberate these mechanisms - which thrive on simplicity.The Golf Swing adopts a modern, scientific approach, by combining two sciences: golf swing mechanics and human skill learning. The analysis goes well beyond simply describing a good swing - it explains how to get one. Phil Mickelson, winner of 34 PGA Tour events, teams with Emmy Award-winning producer-director Terry Jastrow for Secrets of the Short Game, a two-disc DVD focusing on all shots played from 50 yards. "The goal here," says Mickelson, "is to help golfers build a foundation so that their practice time directly correlates to improved scoring on the golf course." The DVD set includes sections on putting, chipping, sand shots, and the flop shot Mickelson popularized soon after he joined the PGA Tour in 1992. Two discs focusing on the short game of golf: Features interactive menus and scene selection. Running Time: 105 minutes. Golf is perhaps the most complicated simple game ever invented. Golfing greats like Jack Nicklaus and Tiger Woods make the sport look easy, but anyone who has ever picked up a club knows how truly frustrating golf can be. The success of each shot depends on a diverse range of factors, from the club you choose and the speed with which you swing it, to your mood, the weather, and even the type and cut of the grass. Science plays a crucial role in most, if not all, of these factors, and in Golf Science, sports science expert Mark F. Smith investigates the cutting-edge scientific wonders that take the ball from tee to hole. Each chapter explores a different facet of the game—mind and body, the swing, the equipment, the environment, coaching with technology, the practice process, and the score—and is organized around a series of questions. What happens in the brain during the preshot routine? Does head movement hinder swing performance? Will I hit the ball farther with a longer driver? Why do I lose distance into the wind? What can I learn from watching my ball in flight? How should practice be structured? What are the key stats in golf that I need to know? Each question is examined with the aid of explanatory diagrams and illustrations, and the book can be used to search for particular topics, or read straight through for a comprehensive overview of how golfer and equipment work together. A must-have for anyone who delights in the spirit of the game, Golf Science will be enjoyed not only by professionals and coaches but also by spectators of the PGA Tour and anyone who enjoys a round of eighteen holes on the weekend. Golf Swing FxV (Force x Velocity = Power) is for all golfers who desire to improve golf swing power, and avoid lower back pain. This book will make you aware of what you are doing to your lower back during the golf swing, and will show you what you can do to protect and enhance your power performance. Many times golfers wait until they are hurt to seek help from their doctor for their lower back injury. The targeted torso golf fitness program provides you with help before anything happens, and in doing so, you will find that your performance will be enhanced as well.Golf Swing FxV is a simple to follow torso conditioning program which is scientifically based, which helps you prepare your back for the rigors of the golf swing in a year-round fashion. The power specific golf training program utilizes a periodization system, which varies it's conditioning intensity around the activity of the typical golf season. Each month focuses on various performance variables such as muscular endurance, strength, and power. The personalized exercise prescription format, allows you to follow the exercise schedule based on your own physical ability. Photos and instructions detail all of the exercises used in the program. “The game of golf is a ‘work in progress’ for the ambitious player. You never reach the point at which you have mastered the game, because the knowledge and skills it demands are virtually limitless.” Jack Nicklaus. Led by a Foreword on how to win by the world’s greatest player, this book provides key insights from sport science research, professional practice and case-study contributions from internationally recognised experts. Coaches, sports scientists, players and those involved in their preparation will benefit from this excellent resource.